A WWII medal awarded to an heroic pigeon whose story inspired a Hollywood film, is to go on display. 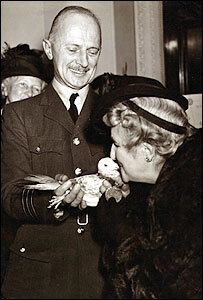 Gustav, trained by Frederick Jackson, of Cosham, Hampshire, was the first of the RAF's Homing Pigeon Service to bring back news of D-Day to the UK. The bird's Dickin Medal, one of 32 awarded to pigeons who carried secret messages during WWII, is due to go on show at Portsmouth's D-Day museum. Their story was recently made into the film Valiant, starring Ewan MacGregor. Gustav was one of six carrier pigeons given by the RAF to Reuters war correspondent Montague Taylor, who had gone with Allied Forces across the English Channel. The birds were taken to battle in wicker baskets on servicemen's backs and set free to fly home with vital information. Gustav was released off the Normandy coast and, faced with headwinds of up to 30mph and no sun to guide him on a cloudy day, he flew 150 miles to a pigeon loft in Thorney Island, near Portsmouth, in a journey that lasted five hours and 16 minutes. His handler, Sgt Harry Halsey took the message that read: "We are just 20 miles or so off the beaches. "First assault troops landed 0750. Signal says no interference from enemy gunfire on beach... Steaming steadily in formation. "Lightnings, typhoons, fortresses crossing since 0545. No enemy aircraft seen." Gustav was awarded his honour by Maria Dickin, founder of animal charity the PDSA, on 1 September 1944, one of only 60 animals to ever receive the bravery accolade. Paul Raymond, head of museums and records services, said: "With the 61st anniversary of D-Day on 6 June this is the first time the medal has been displayed in Portsmouth. "Gustav was a real local hero, putting his life on the line to bring back vital information on the success of D-Day. "The family which owned him have very kindly lent the museum his medal, giving everyone in the city the opportunity to find out about a fascinating part of our local history."